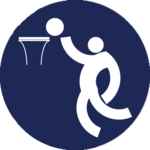 Basketball at the 2018 Asian Games was held in Jakarta, Indonesia from 14 August to 1 September 2018 and contested two events: 5x5 and 3x3 basketball. This was the first Asian Games tournament for 3x3 basketball. Basketball was one of the sports that will be held ahead of the opening ceremony of the 2018 Asian Games. As the opening ceremony was held on 18 August, the opening match for 5x5 basketball was held four days earlier on 14 August. All times are local Indonesia Western Standard Time (UTC+7). The competition consisted of two stages; a preliminary round followed by a final round. Rules for classification: 1) Wins; 2) Head-to-head results; 3) Points scored. A total of 542 athletes from 25 nations participated (the numbers of athletes are shown in parentheses). North Korean athletes were rostered to participate in the women's 5-on-5 tournament alongside South Korean athletes in a combined women's Korean team. ^ "Basketball 5x5 Sports Technical Handbook" (PDF). Indonesia Asian Games 2018 Organizing Committee. 15 February 2018. Retrieved 2 June 2018. ^ "Basketball 3x3 Sports Technical Handbook" (PDF). Indonesia Asian Games 2018 Organizing Committee. 15 February 2018. Retrieved 2 June 2018. ^ "Ten Thrilling Sports To Be Competed First Time In Asian Games 2018". Ministry of Tourism, Republic of Indonesia. 8 August 2018. Retrieved 12 August 2018.